David Bates - A village in mid-Wales, 1895 - Online gallery supplying original fine art. Trending Modern British and Contemporary Welsh. Available for sale from Big Sky Fine Art; this original oil painting by David Bates dated 1895.<br> The painting is presented and supplied in a mid 20th century ornate frame. The painted surface has benefitted from some restoration, cleaning and conservation, which took place in 2012 on our instructions. The canvas was lined during this restoration process. 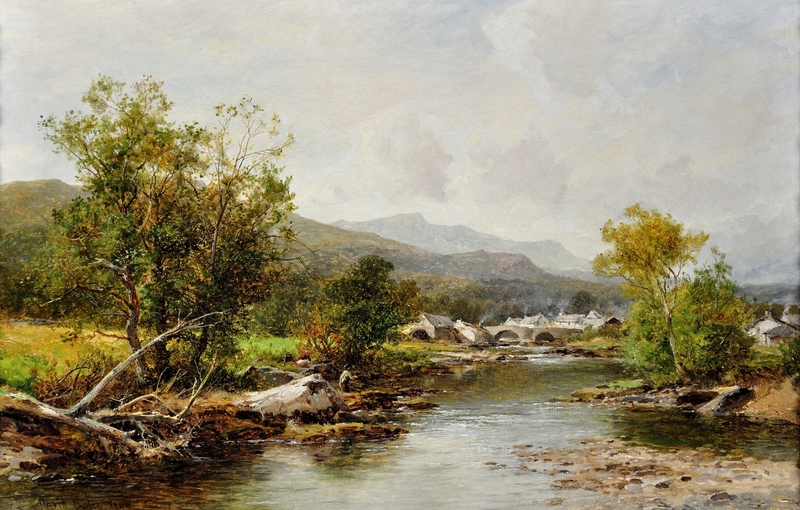 <br> The painting is signed and dated lower left.<br> Previously with John Noott, Broadway, Worcestershire.<br> <br> David Bates was a British landscape painter, who spent most of his life in the Midlands and belonged to the Birmingham school of artists. He lived in Great Malvern and later in Edgbaston, Birmingham.<br> <br> He was born in Cambridgeshire and spent most of his early life in Worchestershire, where he became apprenticed to the Royal Worcester Porcelain Factory from 1855. He became well known for his floral works on porcelain. He left to pursue a full time career as a professional artist in 1880. <br> <br> He travelled extensively around Europe and North Africa, including Switzerland and Egypt, then returned to Britain where he established a reputation as an accomplished landscape artist. Many of his best landscapes are of Scotland or Wales. He was however also a proficient painter of figures, cattle and farmworkers. <br> <br> David Bates was an “open air” artist, and his works display considerable technical ability and captures the lushness and detail of what he saw.<br> <br> He achieved considerable recognition and exhibited at the principal London galleries from 1868, including 26 paintings at the Royal Academy between 1863-1893. Lord Leighton, then President of the Royal Academy purchased one picture himself. Bates also exhibited at the Royal Society of British Artists, the Gratton Gallery, Suffolk Street and the New Watercolour Society.<br> <br> Today his work is held by the Liverpool Museum and the Worcester Museum and Art Gallery.<br> <br> This original oil painting, painted in 1895, depicts a village in mid Wales in the late Victorian era. The centre of the painting shows a wide stream or small river which has meandered down from the hills and mountains shown in the background. At the side of the riverbank is a large fallen tree. Close to the village is a stone bridge, with two arches spanning the river. Beyond that are whitewashed cottages and houses with grey slate roofs. Wisps of smoke rise from the chimneys. There are trees along the river banks and green fields either side. The sky above is pale grey with light clouds. The rich colours of the trees suggests that the season is late summer to early autumn. Available for sale from Big Sky Fine Art; this original oil painting by David Bates dated 1895. The painting is presented and supplied in a mid 20th century ornate frame. The painted surface has benefitted from some restoration, cleaning and conservation, which took place in 2012 on our instructions. The canvas was lined during this restoration process. The painting is signed and dated lower left. Previously with John Noott, Broadway, Worcestershire. David Bates was a British landscape painter, who spent most of his life in the Midlands and belonged to the Birmingham school of artists. He lived in Great Malvern and later in Edgbaston, Birmingham. He was born in Cambridgeshire and spent most of his early life in Worchestershire, where he became apprenticed to the Royal Worcester Porcelain Factory from 1855. He became well known for his floral works on porcelain. He left to pursue a full time career as a professional artist in 1880. He travelled extensively around Europe and North Africa, including Switzerland and Egypt, then returned to Britain where he established a reputation as an accomplished landscape artist. Many of his best landscapes are of Scotland or Wales. He was however also a proficient painter of figures, cattle and farmworkers. David Bates was an “open air” artist, and his works display considerable technical ability and captures the lushness and detail of what he saw. He achieved considerable recognition and exhibited at the principal London galleries from 1868, including 26 paintings at the Royal Academy between 1863-1893. Lord Leighton, then President of the Royal Academy purchased one picture himself. Bates also exhibited at the Royal Society of British Artists, the Gratton Gallery, Suffolk Street and the New Watercolour Society. Today his work is held by the Liverpool Museum and the Worcester Museum and Art Gallery. This original oil painting, painted in 1895, depicts a village in mid Wales in the late Victorian era. The centre of the painting shows a wide stream or small river which has meandered down from the hills and mountains shown in the background. At the side of the riverbank is a large fallen tree. Close to the village is a stone bridge, with two arches spanning the river. Beyond that are whitewashed cottages and houses with grey slate roofs. Wisps of smoke rise from the chimneys. There are trees along the river banks and green fields either side. The sky above is pale grey with light clouds. The rich colours of the trees suggests that the season is late summer to early autumn.